Owning and managing an upcoming retail outlet is no easy task! I hope the main heroine- Kate, who has just come back after working in the huge supermarket for a while, understands it either. As she decides to open her own tiny shop with one employee, she needs your help and your talents, and perhaps your business experience and wits to succeed in retail industry and turn her small shop into most successful supermarket in the entire city. Kate should monitor the shelves all time because the empty ones make the clients angry. 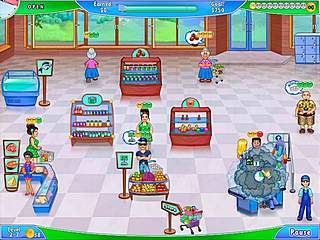 If you’ve played other time management games, then Supermarket Management 2 will be instantly familiar. You control Kate, an aspiring supermarket owner, who must race around the shop, stocking shelves and serving customers to keep them happy. The more they satisfy the more earning you get. In Supermarket Management 2 life follows the ordinary scenario - customers enter the store, take a cart, and go straight to different selves in order to buy something. Kate should monitor the shelves all time because the empty ones make the clients angry. 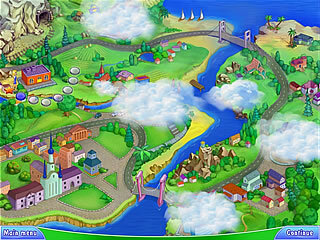 The early levels are easy, and the customers are not that demanding, but later levels become increasingly hectic. The best strategy is to keep Kate moving. She has to go back and forth while helping her customers find the stand with desired stuff or sometimes serve them near other stands playing a sort of mini-games, for example to select the right product by observing the facial expression of a customer. This mini-game as well as the others is familiar to you from the predecessor, and albeit the mini-games are rather fun they do not strike or surprise you very much. 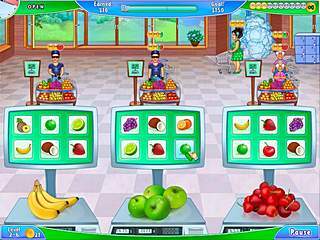 Good and helpful thing in Supermarket Management 2 is that you can hire assistants who will perform certain tasks, such as cashing up, preparing cakes or refilling stands. Unlike most games in Supermarket Management 2 you don’t have just to complete the level having earned some amount of money but you’d better finish a level in expert time and control whether the carts are in their place and stands are completely refilled at the end of a level to get more coins for this. You will be able to purchase unique upgrades, and helpful assistants not for money you earn in each level, but rather for coins. So work quickly to get everything done, cause high race is typical for time management games. Visually, the main game looks okay. It’s done in a cartoon style. Graphics are up to the mark, there’s nothing to complain about. Overall, Supermarket Management 2 isn’t a terrible game, but it is not a great game, either. But hardly the genre veterans will be tickled pink by the greatness of complexity level of Supermarket Management 2, and even newcomers may hardly fail. Well, there must be some trial games to start. Why not Supermarket Management 2 being of this sort? Neko, I don't mind it raining. I unnrdstaed rain is good for the environment etc. I mind it raining vindictively. On Saturday the skies were clear blue ALL DAY apart from the five minutes I was walking from Waitrose to my flat. EVERY SINGLE WEEKEND IT DOES THIS.And umbrellas aren't really practical when both hands are occupied with holding heavy bags of shopping. *grumble*I should move to Ethiopia or something at least that way my misery will be for the good of humankind.And Nils good one! I'd forgotten the HtG2 reference! (Shocking admission though that is). I was thinking along the lines of Tom Holt and Nothing But Blue Skies with the rain dragons Hey, perhaps I have a Rain Dragon in love with me? Neko, I don't mind it raining. I urntdseand rain is good for the environment etc. I mind it raining vindictively. On Saturday the skies were clear blue ALL DAY apart from the five minutes I was walking from Waitrose to my flat. EVERY SINGLE WEEKEND IT DOES THIS.And umbrellas aren't really practical when both hands are occupied with holding heavy bags of shopping. *grumble*I should move to Ethiopia or something at least that way my misery will be for the good of humankind.And Nils good one! I'd forgotten the HtG2 reference! (Shocking admission though that is). I was thinking along the lines of Tom Holt and Nothing But Blue Skies with the rain dragons Hey, perhaps I have a Rain Dragon in love with me? This is Supermarket Management 2 review. Download this game here.